The XFL provided Adriano Belli with his first job in professional football and a life lesson on the perils of Sin City. Upon receiving his first game cheque from the Las Vegas Outlaws in 2001, Belli decided to put the US$7,000 towards buying his first car. Trouble was, the 40-year-old Toronto native was living in a hotel that also had a casino. On Thursday, WWE boss Vince McMahon announced he was kick-starting the renegade spring league to resume play in 2020. 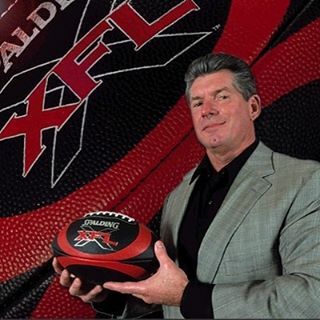 McMahon originally unveiled the XFL in '01 but it died after just one year. Belli is bullish on the reincarnation because it will be based more on football and not gimmicks and professional wrestling. Jim Barker, a longtime CFL coach and front-office executive, agrees. He served as the offensive co-ordinator of the XFL-champion Los Angeles Xtreme in '01. "Trust me. (McMahon) has done his research and is learning what the public wants,'' Barker said. "For me, it was football and I coached and taught schemes the same way I've always done ... it was coaching at its purest, it was the best. Belli went on to play 11 seasons in the CFL and won two Grey Cups. But the six-foot-five, 290-pound defensive lineman's excellent XFL adventure continued well after the Outlaws concluded their season. "I was getting ready to drive back (to Toronto) but I didn't have a license plate for the car,'' Belli said. "So I went to the souvenir shop and you know those fake license plates that say ViVa LV. Luckily, Belli had some money to show for his time in Las Vegas, but just barely. He had some uncashed game cheques when the league folded but fortunately was able to get them honoured. Vancouver native Paul McCallum will forever be an XFL trivia question. The 23-year CFL veteran scored the league's first-ever points, booting a 25-yard field goal in Las Vegas's season-opening win over the New York/New Jersey Hitmen. "My XFL experience is right up there,'' said McCallum, 48. "A lot of good memories. The XFL struggled mightily in 2001, reportedly losing US$50 million as the experiment to blend pro wrestling with football simply didn't work. The league also featured many gimmicky rules, not the least of which was how it determined the opening kickoff. Instead of having a pre-game coin toss, players from each team ran 50 yards downfield to recover a football with the winner choosing whether to kick or receive. In 2020, McMahon has promised quick games, no gimmicks and no players with character issues. Back in 2001, the league's pay scale was such that most players made US$45,000. Quarterbacks were paid $50,000 while kickers received $35,000 but during the regular season all players on winning teams split equally a $100,000 bonus. For winning the XFL title, the Xtreme players split a $1-million bonus. McCallum thoroughly enjoyed his time in Las Vegas, and with good reason. He was living in a gated community and driving a Porsche thanks to meeting someone whose father owned an exotic car dealership. The Outlaws wanted him back so much they offered McCallum a marketing/sale job during the off-season at his football salary, then were prepared to double his stipend for the 2002 campaign. "I was living the life,'' he said with a chuckle. "But I remember driving and getting a call from a friend asking me if I'd heard the league folded. Belli said with the dearth of quality players all looking for jobs, he expects the new XFL to offer an exciting brand of football.